The Old Trafford club sacked the Portuguese manager earlier this week after a disastrous start to the season. Roy Keane says the Manchester United players treated Jose Mourinho with disrespect. ROY KEANE BELIEVES that Manchester United players “got away with murder” in their behaviour towards Jose Mourinho who was sacked as manager of the Old Trafford club earlier this week. Ole Gunnar Solskjaer has taken over as caretaker manager of Man United after the side parted ways with Mourinho who had been in charge for two-and-a-half years. It has been a dismal campaign so far for United following their worst start to a season since 1990, and Roy Keane thinks the players acted disrespectfully towards Mourinho and threw him “under a bus”. “I do think the players obviously got away with murder just in the way they hide behind their manager,” he told BBC Radio 5 Live. They’ve thrown him under the bus and people say Mourinho’s been falling out with players, well you would fall out with players — that’s the name of the game when players turn up overweight or aren’t training properly and not producing. “And then for some of them to down tools, shame on some of them players. I’m not Mourinho’s biggest fan, don’t get me wrong, but I just can’t tolerate footballers who hide behind their agent, their pals in the media. Roy Keane, former #ManUtd captain, gives a scathing verdict on the players' behaviour over the Mourinho sacking, in an interview with Adrian Chiles. 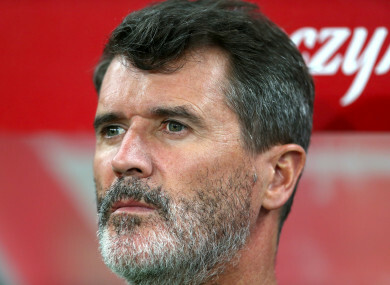 It was then put to him by presenter Adrian Chiles that perhaps United are in need of a better captain, and suggested that Keane would have been able to inspire change in the dressing room given the leadership he provided at Old Trafford during his playing days. “I suppose people say I’m a bit old school, I don’t call it old school, I call it good school. No matter what’s going on at your club, when you go out onto that pitch, particularly at a big club like United, you go out and give it your all, no excuses. It doesn’t mean to say that you’re going to play well. This idea that these players are maybe a little bit upset — and it’s not just at United — the modern player, they’re not just weak players they’re very weak human beings. You can’t say a word to them. “I was very lucky with the dressing room I was in, they were good men, good leaders, good characters. But that is definitely a shortage in the game now. “I know the game has changed a little bit but the players do get away with murder and it’s really frustrating. It wouldn’t have happened in our dressing room just because we had good characters and good leaders. Email “'They've thrown him under the bus' - Roy Keane blasts Man United players over treatment of Mourinho ”. Feedback on “'They've thrown him under the bus' - Roy Keane blasts Man United players over treatment of Mourinho ”.